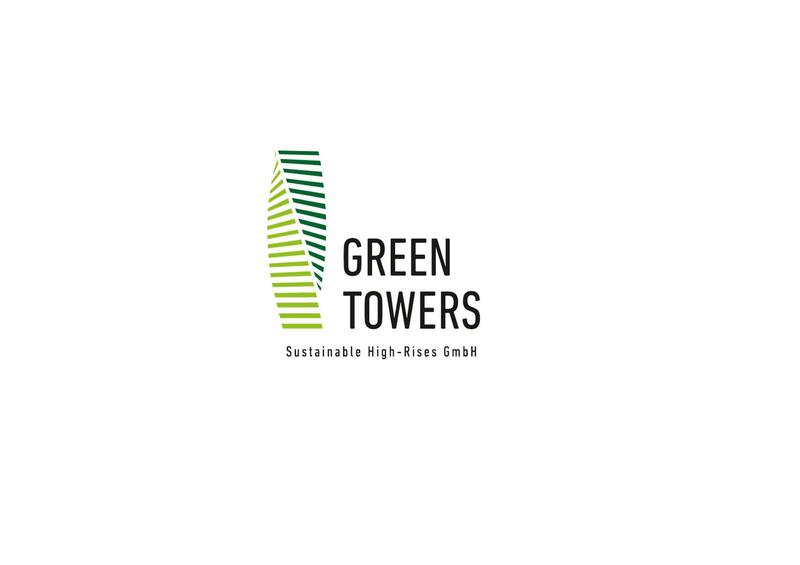 Green-Tower sustainable high-rise GmbH of Frankfurt presents a new paradigm in residential tower living- an environmentally intelligent, vertical garden lifestyle experience is born. 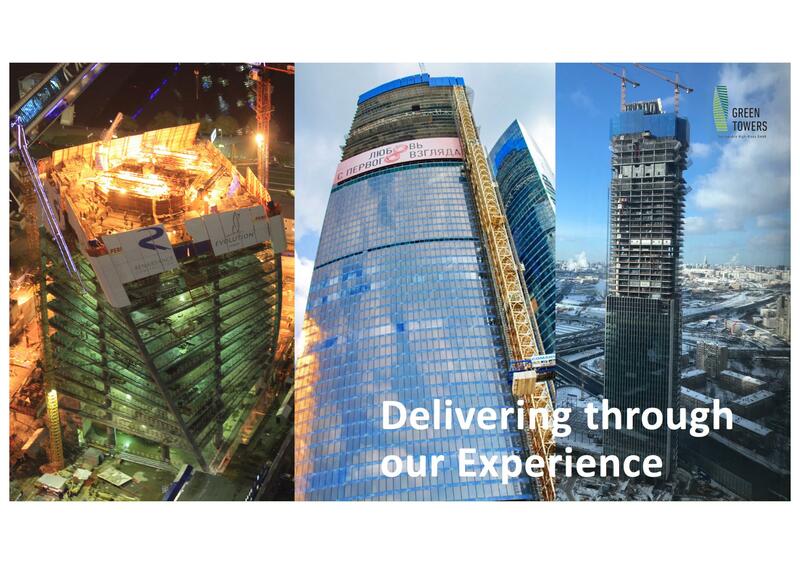 Marketing & Finance Opportunities. 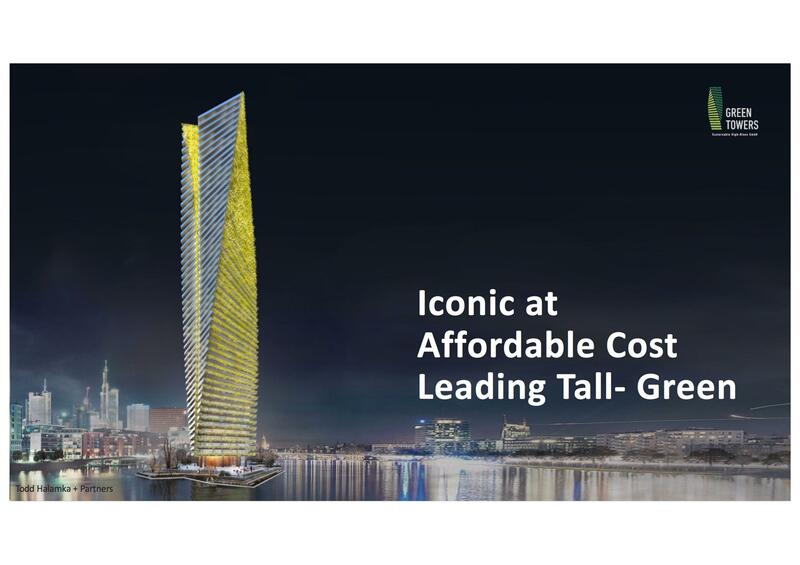 The extensive iconic high-rise design, development and execution experience of the Green-Tower Team ensures that high-end performance can, despite its many innovative features, be positioned safely at ´value for money´ prices in the market, thru a disciplined use of repetitive building systems and components. 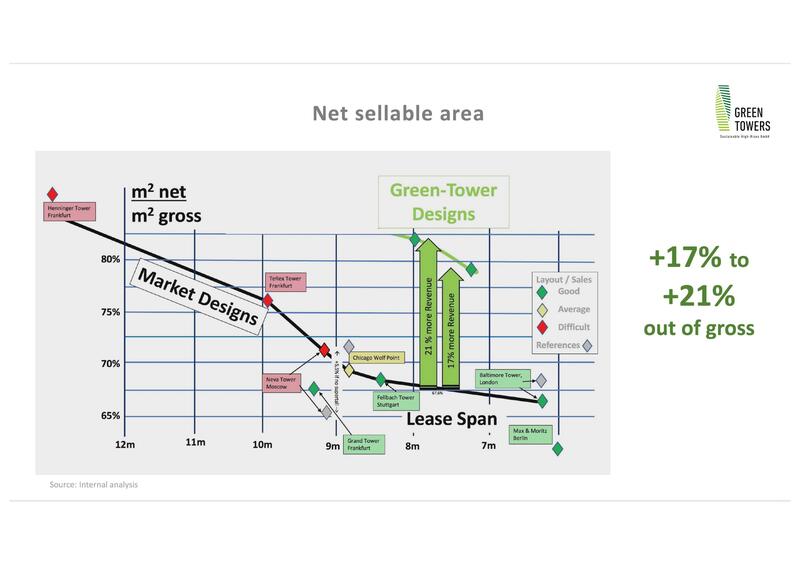 Green Tower Frankfurt’s 24x24m2 enclosed building area delivers high net-to-gross area efficiency, with nearly half the floor plate size of most of the prevailing residential tall building market. Th resulting smaller finance volume offers better diversification and less risk, attractive NPV and IRR. Aesthetic design innovation. 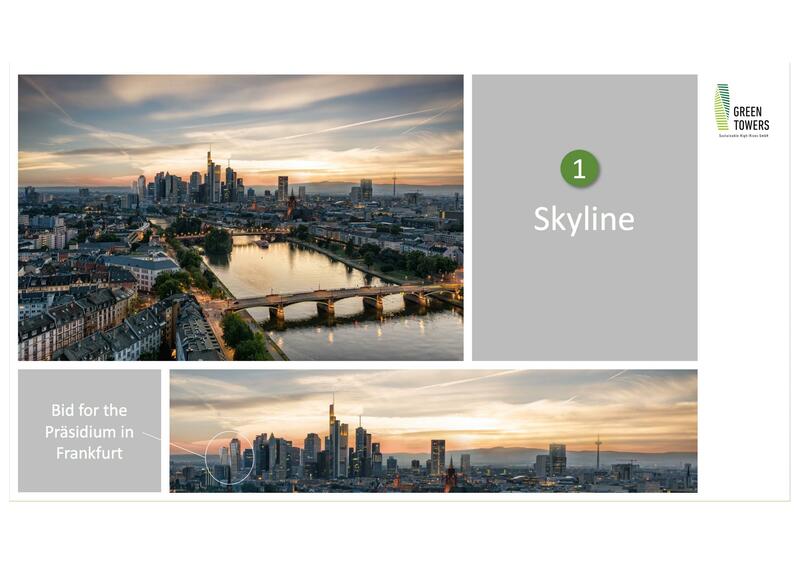 Green Tower Frankfurt presents a contemporary apartment layout design that emphasizes modern lifestyle amenities, visual excitement and program efficiency. 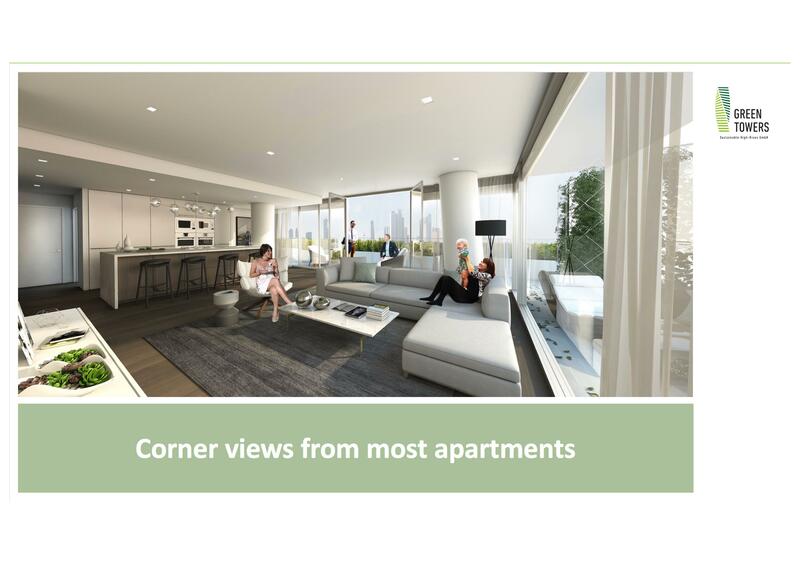 Each typical apartment offers a corner, spatially open living/dining/kitchen floor plan that forms the center of family and entertainment tower-living experience; each with stunning corner views thru top to bottom glass facades overlooking the city below. 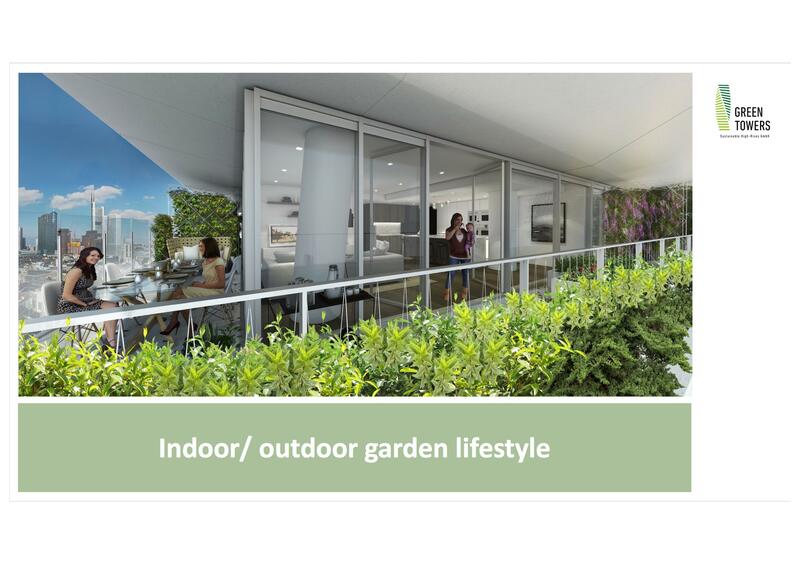 Continuous, wrap-around, four-sided planted garden terraces provide indoor/out- door multipurpose living-spaces that connect the occupant with nature, climate and place; further enhancing a socially active, vertical garden lifestyle. 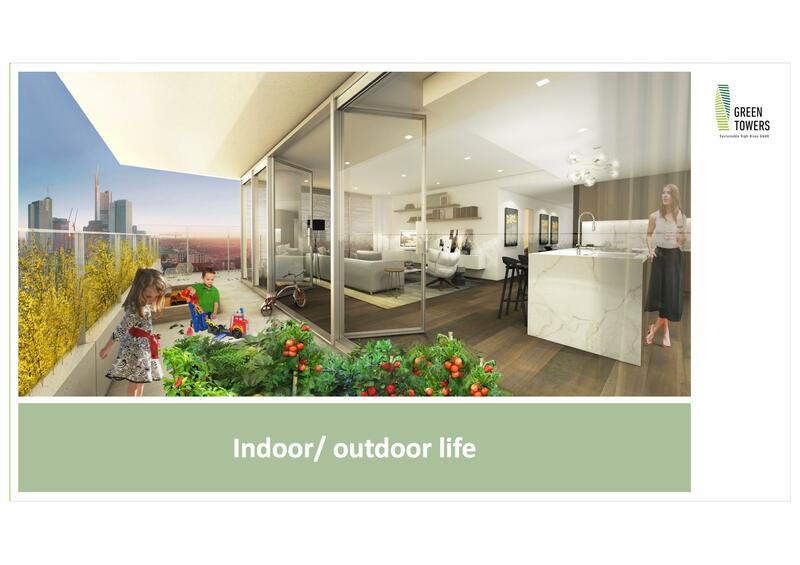 A rigorous optimization of core and structure develops a compact, highly efficient 24x24m2 interior floor plan that compliments the wrap-around exterior garden terraces. 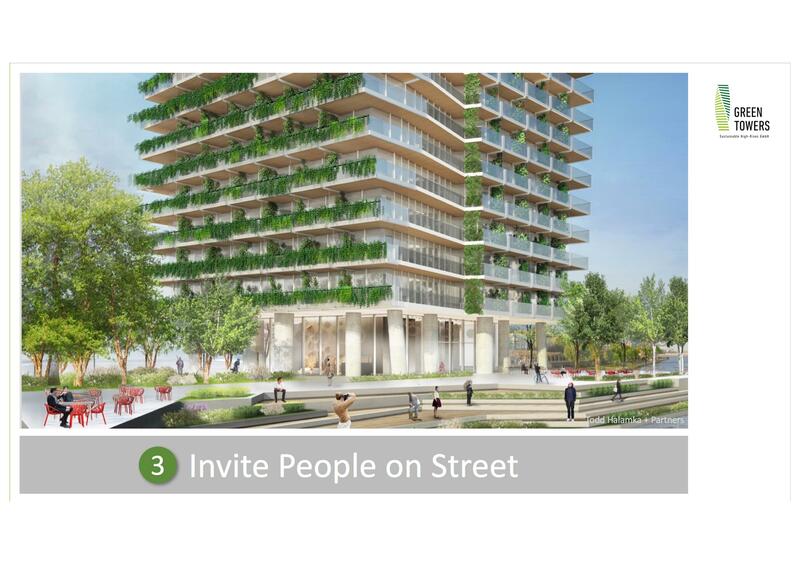 A Vertical Village is thus created, providing barrier-free indoor/ outdoor access throughout the tower, protected from inclement weather, providing the occupants with all one’s necessary daily needs on premise. 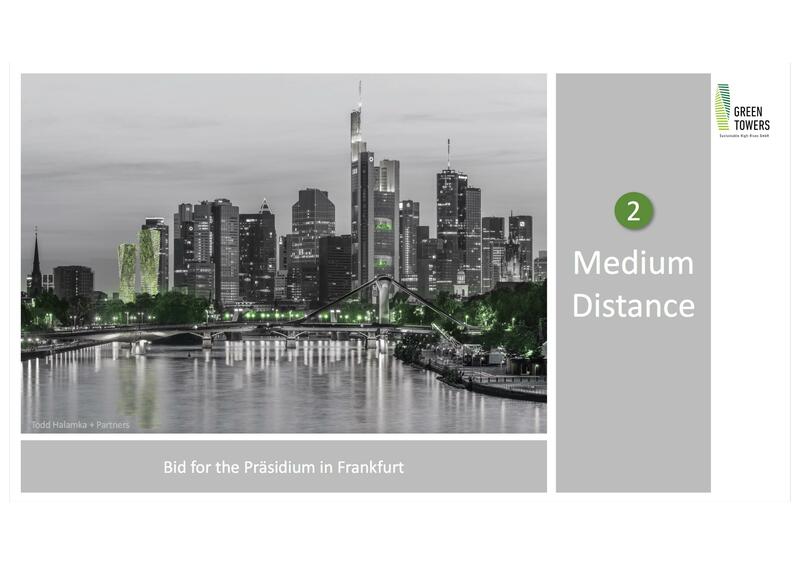 Meeting and multi-purpose amenity spaces, a spa and fitness center, and an inviting plaza level restaurant will connect the Green Tower Frankfurt occupants to the neighborhood, as well as lower level sundry shop. 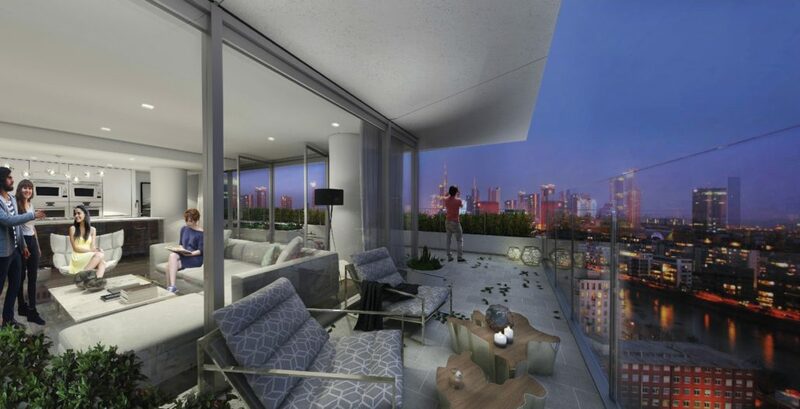 A full complement of 24-7 concierge services, security and even child-care will be provided within the tower. 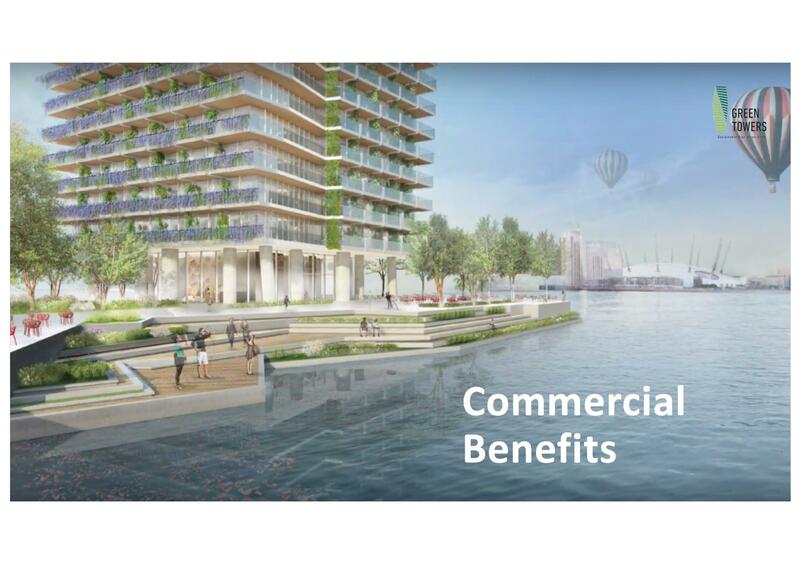 Smart transport and delivery services will also be envisioned. A Comprehensive Garden Façade. 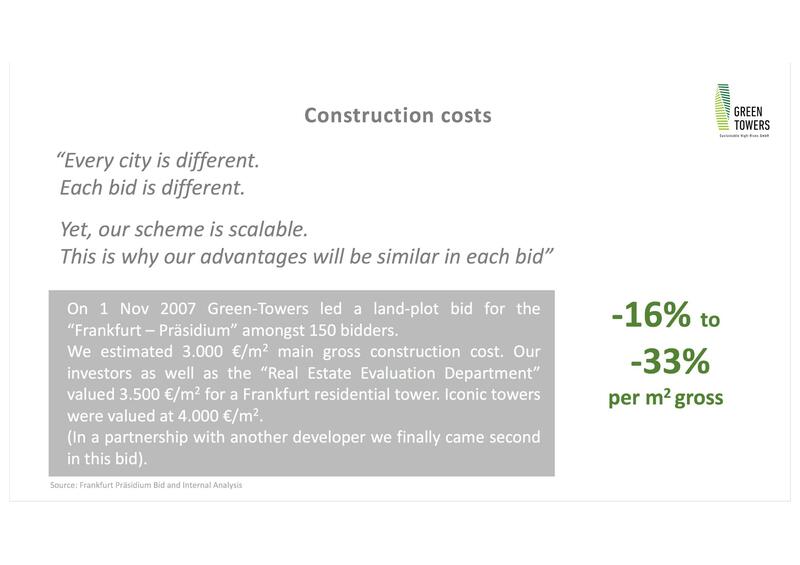 Green Tower Frankfurt will provide a unique and spectacular vertical garden expression to the surrounding city, enriching the neighborhood experience and establishing a new seminal living destination. 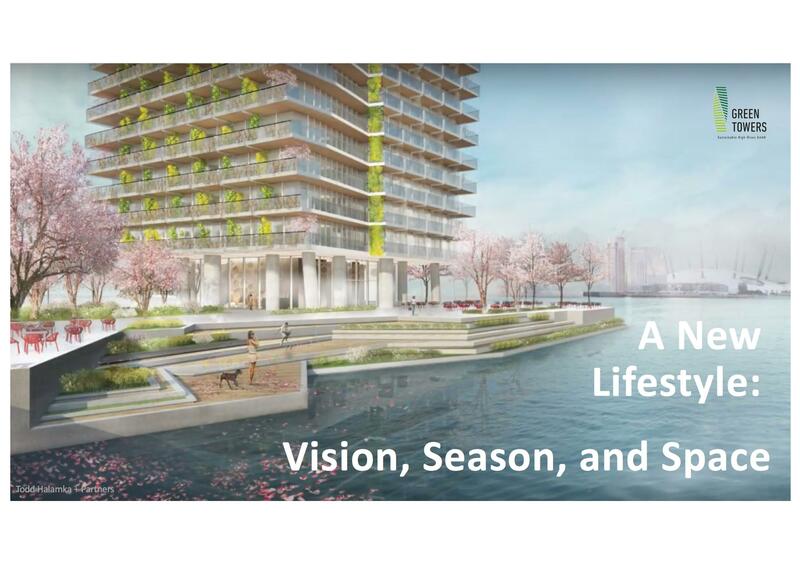 Extensive, terrace-integrated tower plantings of Forsythia, Blue Rain and Wild Wine, will provide stunning seasonal colors by day and extraordinary, illuminated gardens by night. 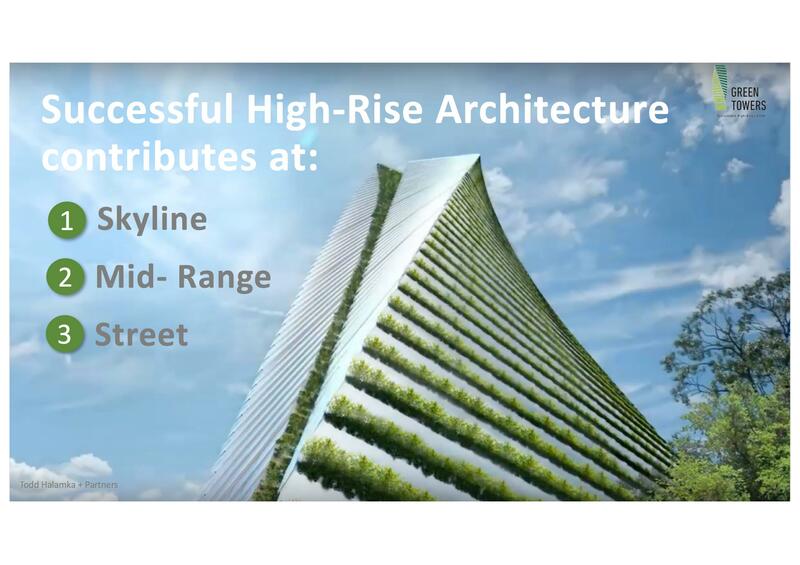 Dense vertical ivy facade planting, integrated with north-facing apartments, intend to foster a natural bird habitat and Vertical Forest. Technological design innovation. 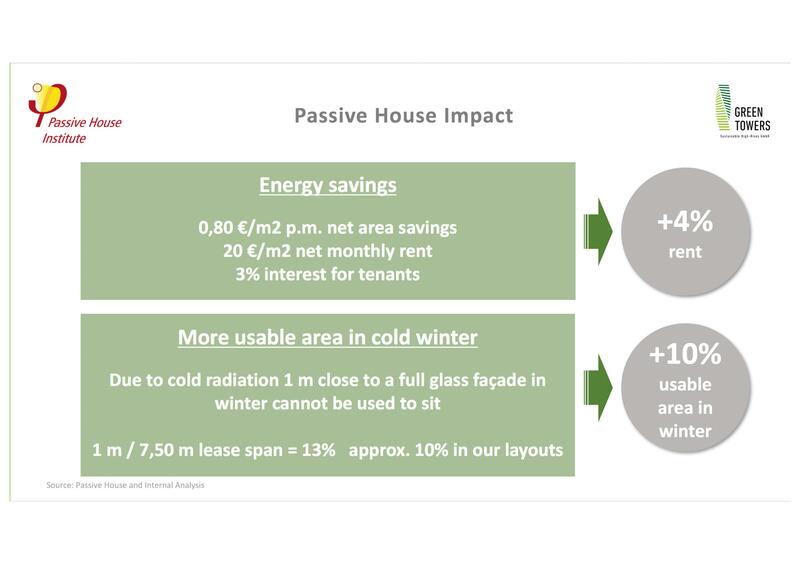 Green Tower Frankfurt using Passivhaus principles emphasizes thermal occupant comfort that eliminates traditional all-glass building failures of thermal shock, air infiltration and thermal bridging. 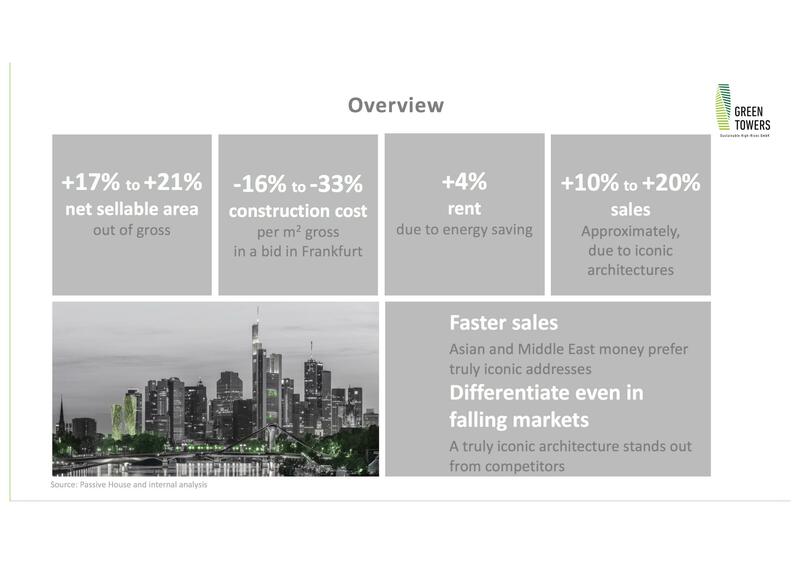 Conversely, Green Tower Frankfurt employs applications of advanced glazing design and extensive interior to exterior material separation, offering the occupant complete comfort at 10% of the annual heating energy costs of the average, existing building stock. 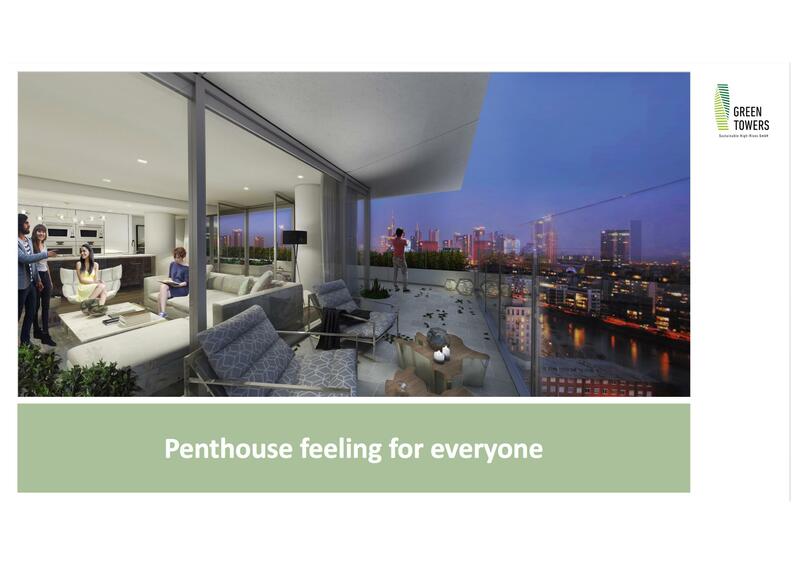 Almost counter-intuitively, the ultra-insulated exterior glass envelope will feel comfortably warm in winter and well shaded in summer. 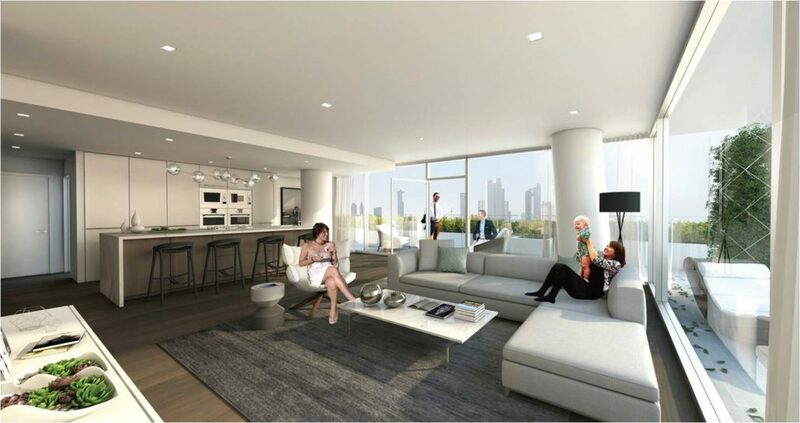 Advanced interior sound protection design will ensure apartment to apartment privacy. 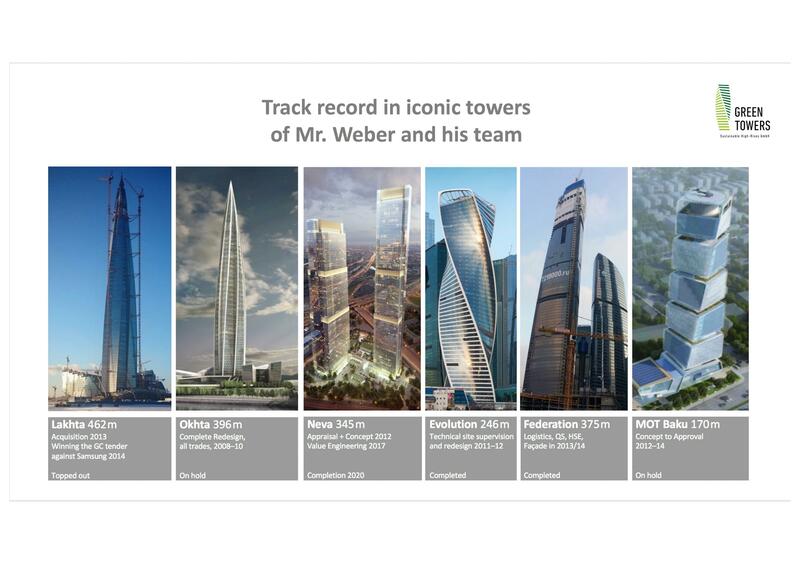 Green Tower Frankfurt anticipates LEED Platinum/Gold certification. 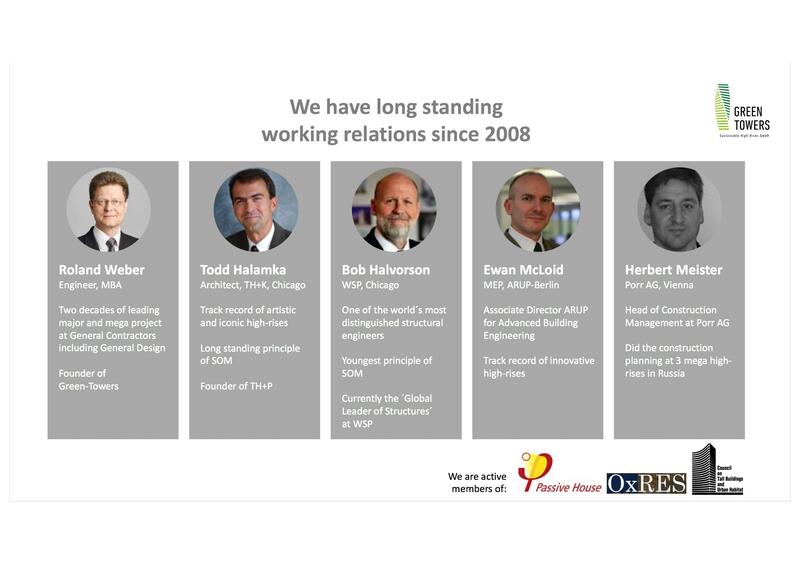 Environmental Leadership. 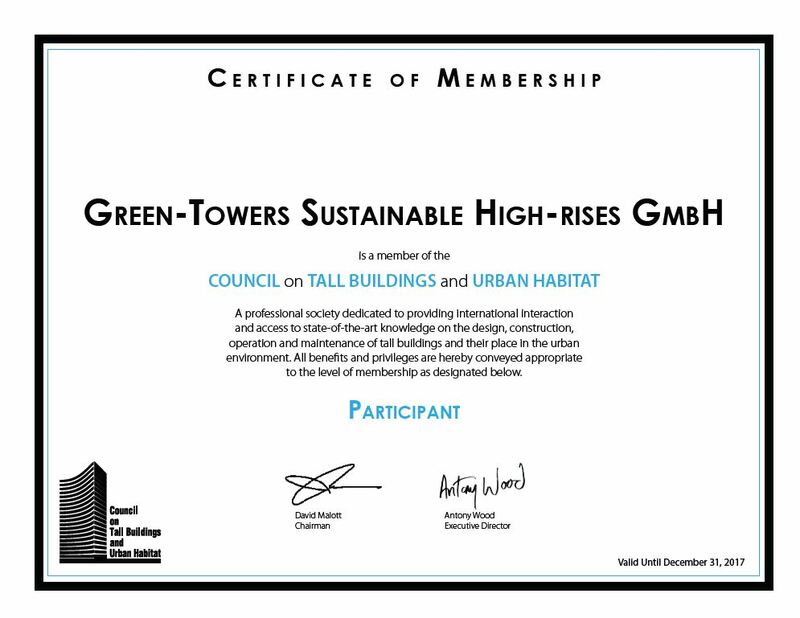 Worldwide we are the first to achieve the rigorous Passivhaus ´Classic´ and ´Plus´ standard in residential high-rise design. 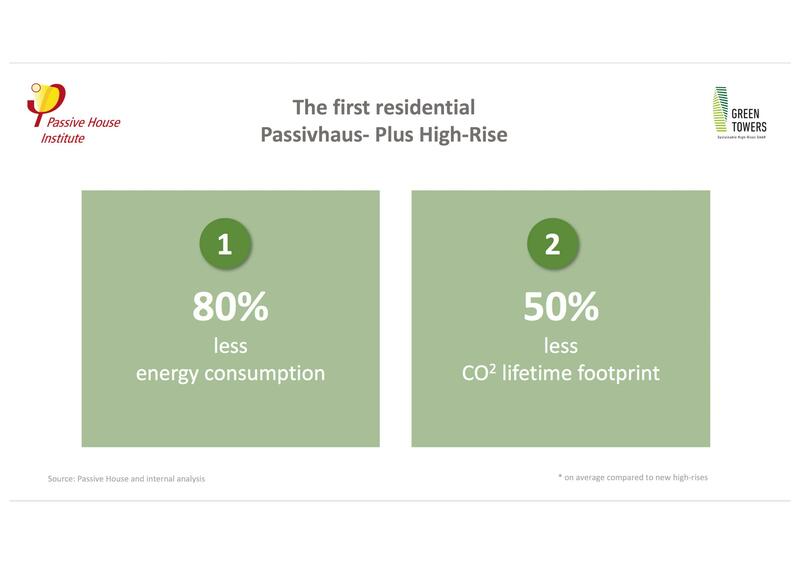 Passivhaus is the leading global energy-conservation, performance, comfort and quality based standard. 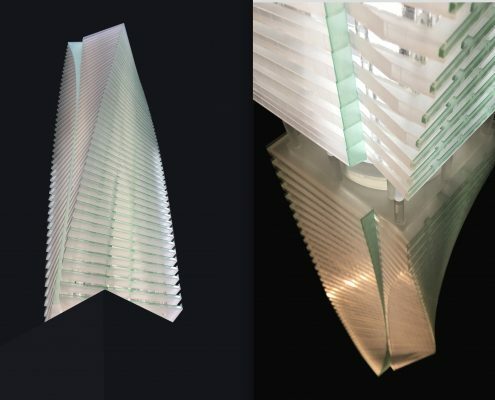 Green Tower Frankfurt, comprises an 80% four-sided full vision glass façade that will harvest as much solar energy in winter as it expels. 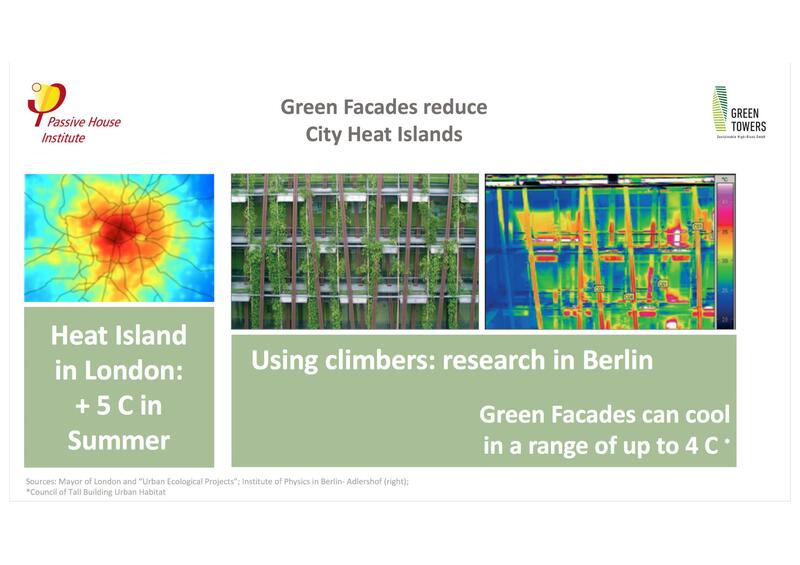 In summer, intelligent shading systems reduce mechanical cooling needs to near zero. 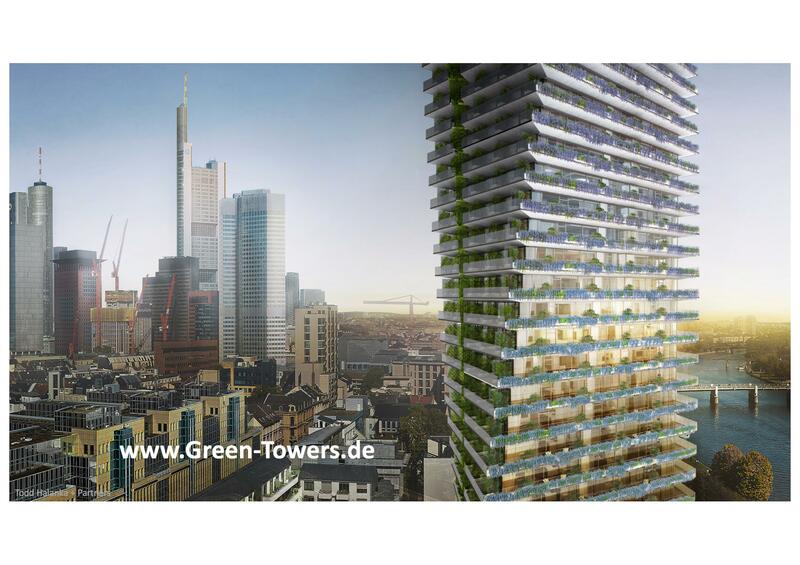 Green Tower Frankfurt filters outside air for clean and allergy free occupant comfort, permitting closed windows to keep exterior noise out.